Embrace your inner-artist this summer! The Tett Centre for Creativity & Learning is delighted to offer an immersive 1-week summer program for kids ages 8-13 years old, in our arts-enriched, heritage building on Kingston’s waterfront. The program is a fantastic opportunity to discover new mediums, build confidence, find new ways of problem solving, and fearlessly express yourself. Participants have the ability to explore a variety of artforms including: metal rocks, pottery, fibre arts, painting, printmaking, book-making, yoga, hand-lettering, felting, drumming and more, while engaging with local artists, community volunteers, and arts organizations who lend their expertise and resources on-site. Our dynamic schedule provides 40 young artists, in groups of 8, a diverse arts experience unlike any other in the city. On the last day, we proudly showcase all artworks made during a special open house for families and friends. 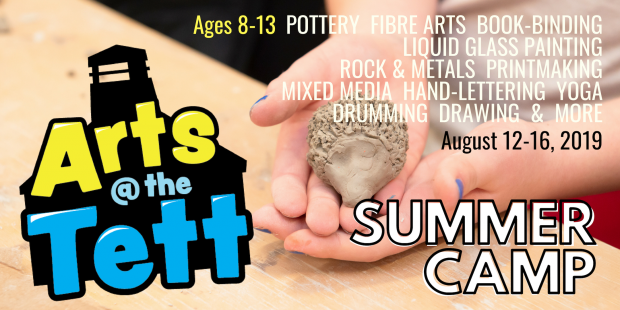 Arts at the Tett Summer Camp runs from 9:00am to 4:00pm Monday, August 12th through Friday, August 16th, 2019. We want to thank our community partners: The Kingston Potters’ Guild, The Kingston Lapidary & Mineral Club, The Handloom Weavers and Spinners, Glocca Morra Studios, Joe’s Mill, Gaetanne Lavoie, Yessica Rivera Belsham & Ollin.ca, StudioPetaBooks, Becca Snowdon and Floriana Ehninger-Cuervo. To enroll your child, please purchase tickets and fill-out the Arts at the Tett Registration Form via Eventbrite. Full payment is due at the time of registration. Please note, registration ends on Friday, July 12th at 5pm. Spots are limited, register early! For more information visit www.tettcentre.org. If you have additional questions please contact us at arts@tettcentre.org or call us at 343-266-0009 ext 3090. Thank you. We are home to eight tenant arts organizations, eight resident artist studios, and tfour multi-use rentable public spaces. We are a dynamic arts hub that coordinates and creates high-quality, accessible, arts-focused programming for all levels of artistic abilities and experience.